SKB's innovative line of ATA Removable Fly Racks have revolutionized the way you travel and protect delicate electronics and guitar amps with 2U, 3U and 4U models of Shock Racks. The internal Fly Rack frames are made in Orange, California and built of high strength, lightweight aluminum alloy and 11 gauge hot rolled carbon steel rack rails just like the Military Grade Shock Racks. The internal frame contains front and rear rack rails with a 13" rack depth. ABS plastic covers the top and bottom of the removable shock rack for added protection when the rack is out of the case. The rack frame easily fits into SKB's iSeries case that is protected by high quality PE foam that provides space for protruding knobs and buttons. Convenient in-line wheels and push button release pull handle provide easy transport. iSeries Watertight cases are lightweight and under 62 linear inches to keep from being oversized - the perfect solution when flying or shipping delicate equipment. Fly Racks are less than half the weight of standard shock racks. 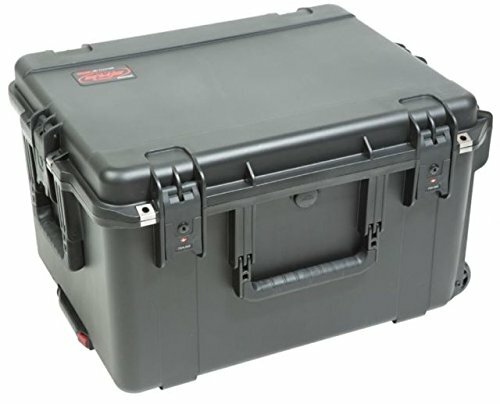 iSeries injection molded waterproof cases are constructed of ultra high-strength polypropylene copolymer resin and feature a gasketed, waterproof and airtight, submersible design (IP67) that is resistant to corrosion and impact damage. Its molded-in hinges, TSA acceptable trigger release latch system, comfortable, snap-down rubber over-molded cushion grip handle, secure stacking, and automatic ambient pressure equalization valve (MIL-STD-648C) all contribute to its military grade design.